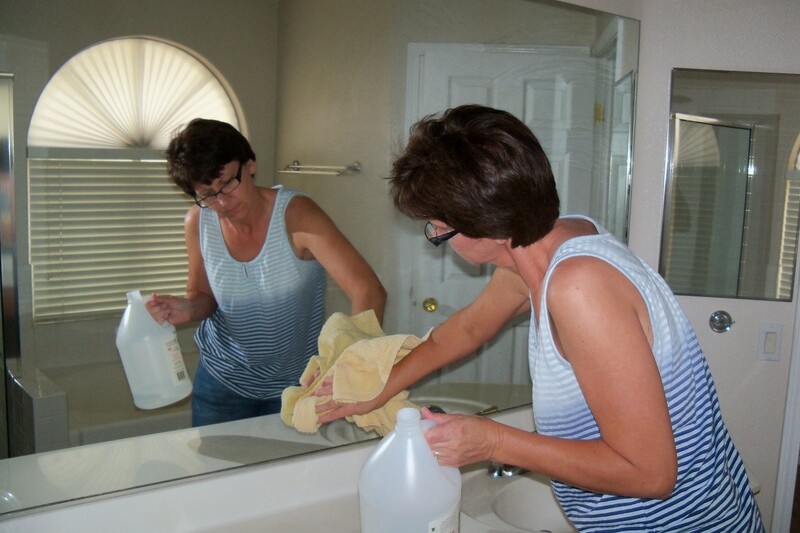 Tammy puts the final touches on the Las Vegas house in preparation for our new tenants. Lots to catch up on. 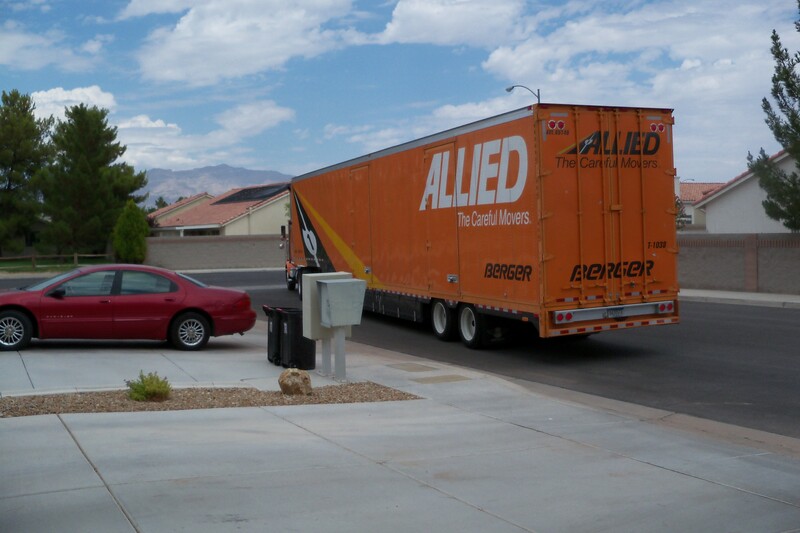 After the Allied moving truck packed up our house, Tammy and I departed Las Vegas in late July. We drove Sara’s Ford Focus 1,500 miles to Ames. We took our time, especially at first, but it was a fairly smooth and uneventful trip. We slept over in Beaver, Utah, Glenwood Springs, Colorado, and Kearney, Nebraska. The mountains of Colorado were beautiful. We made good time through the flatlands of Nebraska. Tammy was dismayed that not a single place we stopped had disposable toilet seat covers. The moving truck leaves Las Vegas. We had just one cat with us, Brett, and he was quiet as a mouse most of the trip. 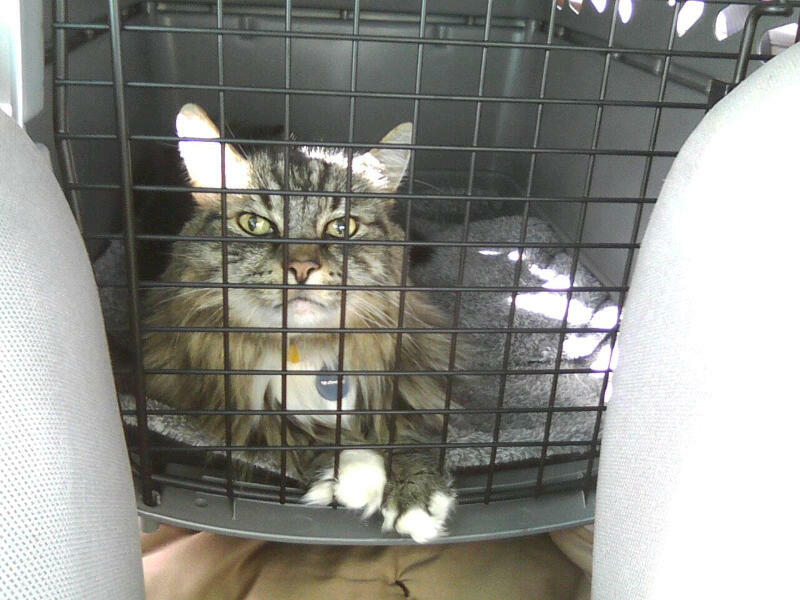 Unfortunately, our other cat, Reggie, Brett’s brother, was put to sleep just two days before we left. Long story short, he suddenly couldn’t walk. We took him to the vet and after several tests, it was clear that at his age, there was no certainty any treatment would be effective. Nerve damage in his spine. He was put to sleep after more than 13 years of good living. He could be feisty with visitors but Reggie brought our family a great deal of enjoyment and companionship. Brett relaxes in the back seat during drive to Iowa. We arrived in Ames several days before we could take possession of the house. We got the keys on the morning of July 31st. The moving truck arrived that same morning and unloaded our stuff. It went quickly and they did a good job. Sara, our younger daughter, flew in to Des Moines a few days later. Ron Paul works the media at Ames Straw Poll. 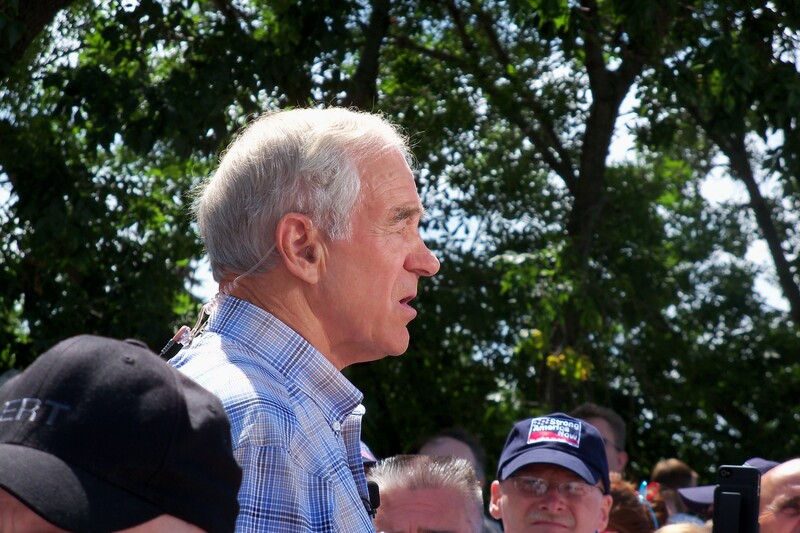 I attended the Ames Straw Poll as a reporter. I was there for about three hours, and tweeted my observations for our paper, the Ames Tribune, and later filed a short story. It was sort of a county fair for the politically minded, with all sorts of things going on in addition to voting for your favorite Republican candidate. About midday, the social media record will show, I predicted Michele Bachmann would win, and she did. Her tent had the longest lines. But Herman Cain had the most popular food: Godfather’s Pizza. 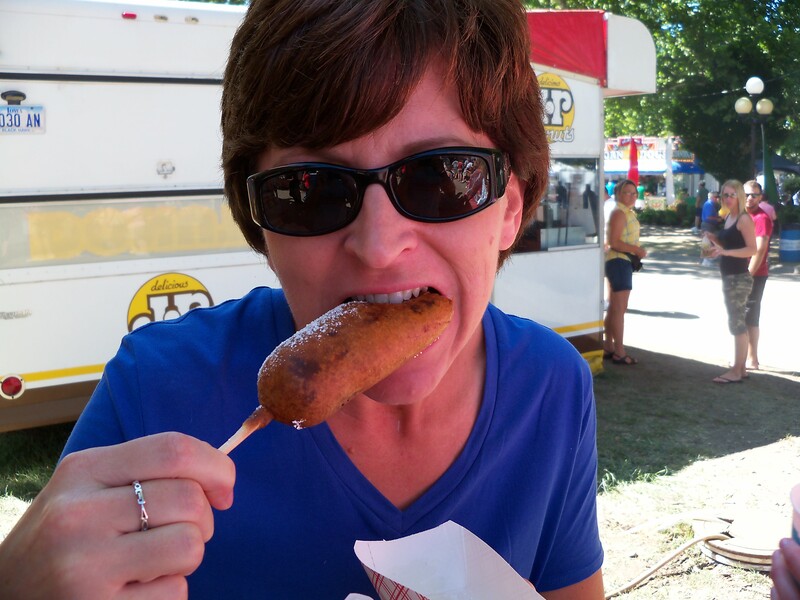 Tammy starts in on a deep-fried Snickers. The next day, Tammy, Sara and I attended the Iowa State Fair in Des Moines. It was good weather and we had a lot of fun. We got the full flavor of the event, including seeing the biggest bull, biggest pig and biggest sheep. We also saw some really big and really small horses, and all kinds of frilly chickens. The standard fair fare. We didn’t go into the snake tent. We ate lots of stuff on sticks, including a deep-fried Snickers. We took a gander at the fair’s most famous attraction, the butter cow, and bought a butter cow Christmas ornament to honor the occasion. 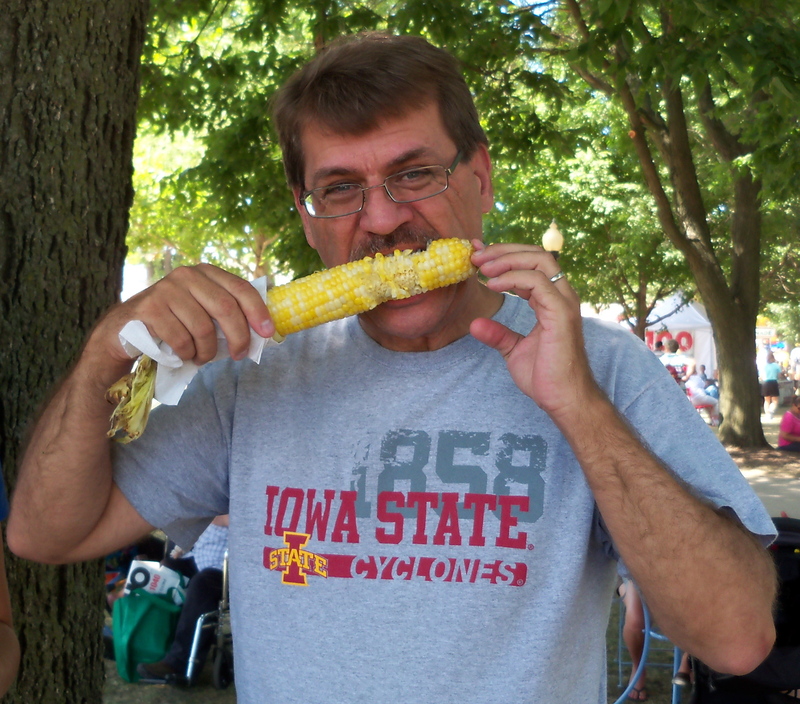 Geoff tackles some fresh sweet corn at the Iowa State Fair. Homework already? 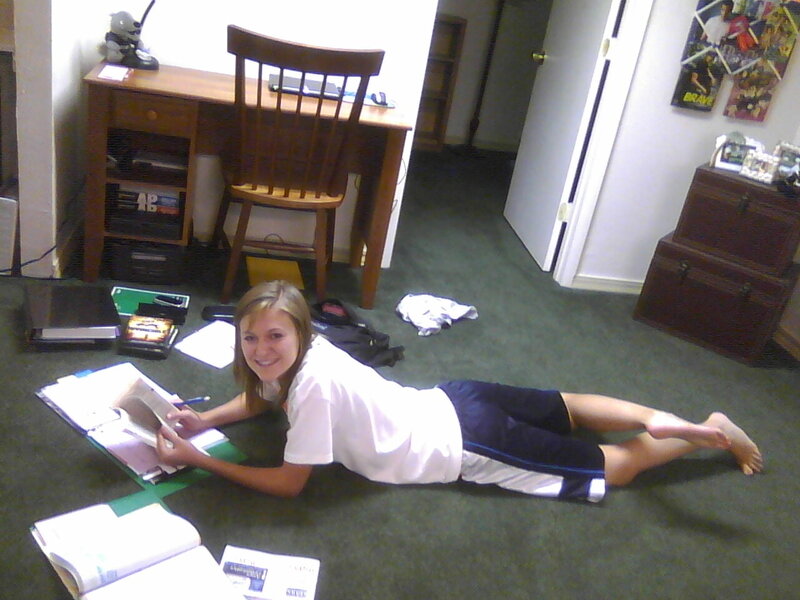 Sara digs in to her homework after two days of school. Sara started school yesterday at Ames High. She drives about half a mile to school. She’s a junior. She really likes some of her teachers. Tammy started a new job. She is an administrative assistant in an American Family Insurance office. She enjoys her four-minute commute, and her office is just two blocks from the newspaper office. 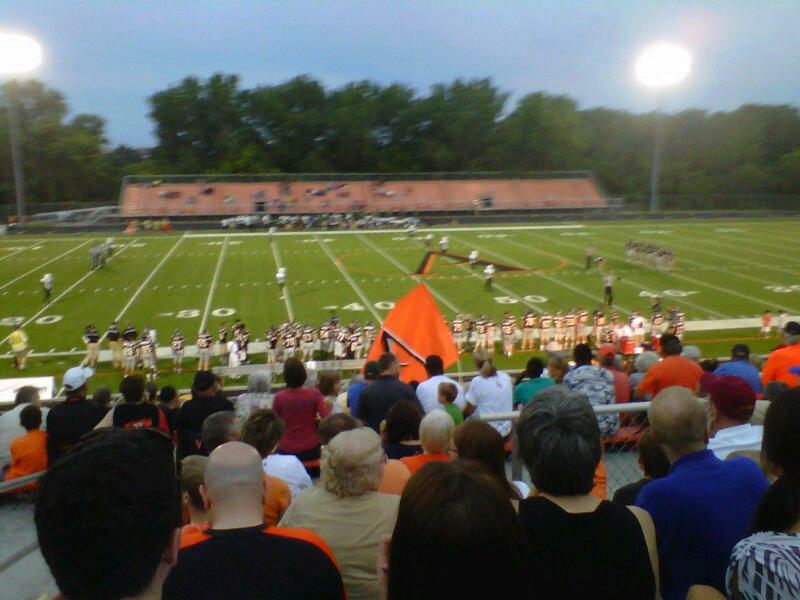 Tonight, Tammy and I attended Ames High’s first football game. It was packed with fans. All the parking spaces were filled, and most of the bleachers on the Ames High side were full. The Little Cyclones led 24-0 midway through the second quarter. They seem to have a pretty good team, though it’s also true that the team they played, Des Moines North, was not good at all. Ames will have tougher challenges ahead. 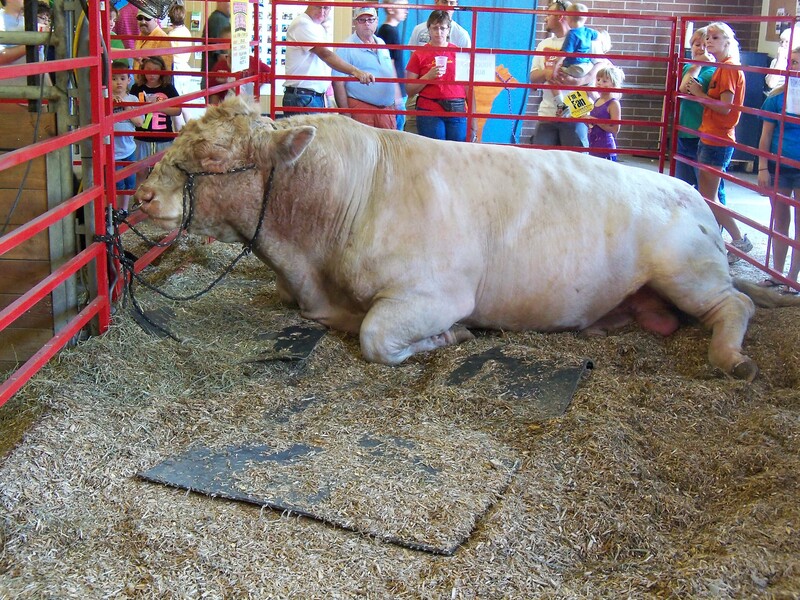 An extremely large bull at the Iowa State Fair. 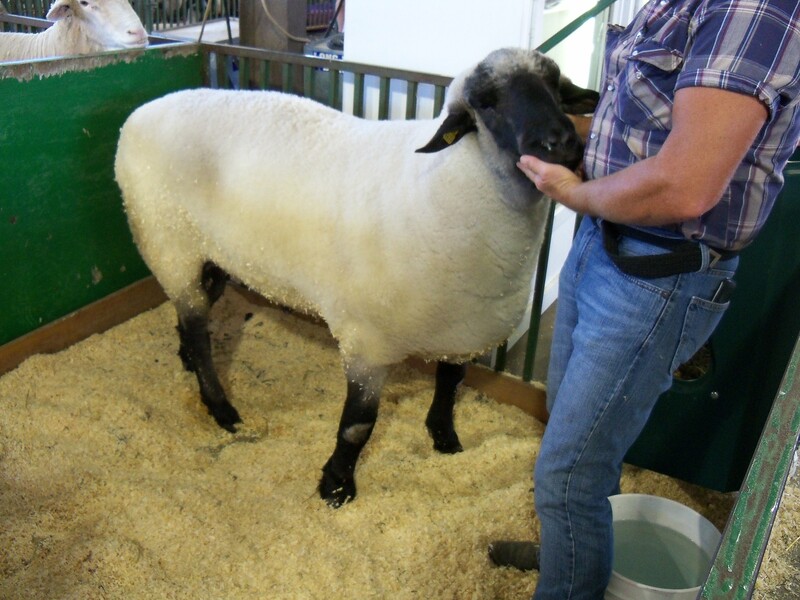 An extremely large sheep at the Iowa State Fair. Our older daughter, Erin, will be coming home from her summer in Europe early next week. She lands in Las Vegas and then almost immediately turns around and flies here to visit us for a couple of days. We’re looking forward to seeing her and hearing about her European adventures. Then she returns to Las Vegas, and she and her husband, David, will drive to Reno to resume their lives as college students there. Big crowd for Ames High's first football game of the season. 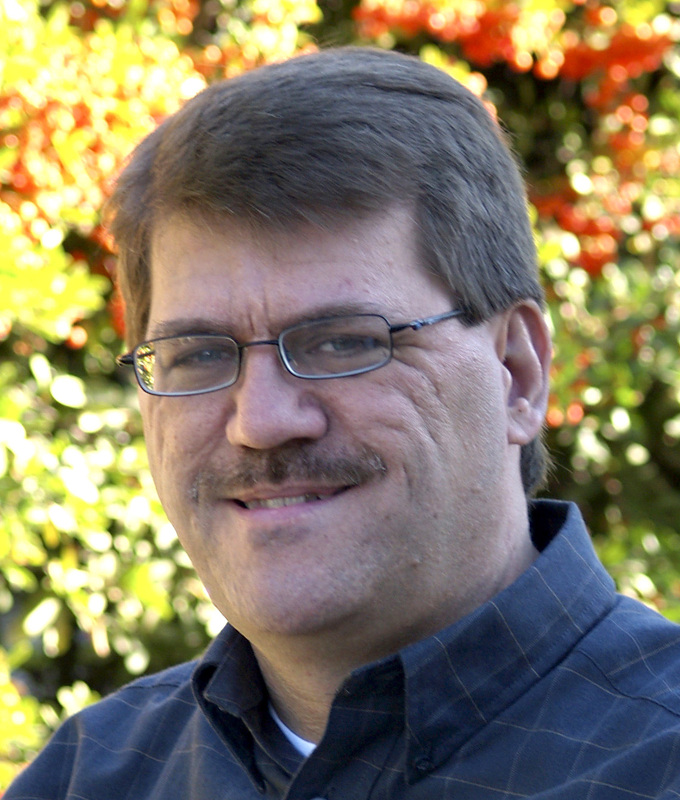 Geoff, I really enjoy this blog for many reasons. I like learning about your family and how all of you are adjusting to the Midwest where I grew up. While visiting family several years ago, I had the same experience as Tammy regarding disposable seat covers in public restrooms. I asked my nephew why no one supplied them and he said, “Aunt Betty, California is the only place you can catch something bad. We don’t have those problems here.” Gheesh. And while I was visiting the county fair where my niece’s cattle were being auctioned to the highest bidder, I waved hello to her as she stood by her animal and the auctioneer thought I was bidding. I was scared stiff until someone “outbid” me. Compared to California, the Midwest is almost like another country. I send good wishes to all of you. As to disposable toilet seat covers, not to worry, tear off a piece of toilet paper and carefully dry the seat and then construct your own cover out of toilet paper. One piece across the back and one down each side and in a few seconds you are ready to go with a Howard Hughes acceptable sanctioned way to pee!!!! I’ve traveled to all corners of the US and haven’t caught a germ yet using that method. Great isn’t it? That brings up the thing about washing your hands, people always ask, “Did you wash your hands AFTER you went to the bathroom?” of their children. I always asked my daughter, “Did you wash your hands, BEFORE and AFTER you went to the BR.” Before, protects YOU, after protects the rest of your family. Just a favorite peeeeeve on the subject!